Toyota used Yamaha 1ZZ-FE engines with the pre facelift version of the Celica T23. The Problem with those engines is that some of them start to consume a lot of oil. The reason is not 100% clear yet. The most likely reason is the combination of zylinder plating and piston ring material. This combination could result in a high abrasion of the piston rings which then leads to the high oil consumption. Also it could be possible that the zylinders deform at high temperatures or that vibrations are the reason. Toyotas response to this issue was to replace the engine for free (cars up to 7 years or 180 000 km). Which means that the Shortblock will be replaced. Cylinder Head and other parts are the same. As I do have one of those engines and do not fit in the guarantee regulations anymore I try to fix the issue on my one. 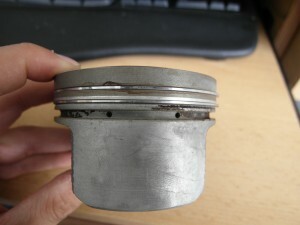 The first piston generations had 2 bores within the groove for the oil-ring. The later versions now do have 4 and they are bigger. My suggestion is that they want to make sure that the oil can flow from the groove to the inside of the piston more easily and is not pressed past the ring. I will try to replace the old version with the new one and see what happens. So I disassembled the "old" engine and replaced the pistons, of course with better piston rings. Also I I changes all bearings, joints and gaskets. So far the engine stopped consuming oil. As soon as I have long term results I will let you know.